Few thing go better with a stiff drink than a good game. And the new Zelda, Breath of the Wild is one amazing game. You know all the wonder and near-infinite array of possibilities that crowd your mind when hearing about a new game, and how it very quickly collapses to nothing when you finally get to play it? Breath of the wild completely destroys this convention and delivers an experience that rivals my memories of the original NES Legend of Zelda in the amount of joy and amazement I’ve had so far. The sheer number of actual interesting things to find spread around the large hand-crafted world with such care makes exploring, wandering even, a genuine and enjoyable tactic. Sight lines are carefully constructed such that reaching a new vantage point almost inevitably reveals several more destinations to explore. Navigational options are plenty and varied, letting whimsy or practicality often be the deciding factor in how a destination will ultimately be reached. Nearly every surface, no matter how sheer the cliff face may be, is climbable, and with a properly prepared lunch, even the limited stamina at the beginning of the game is less of a barrier than it might initially seem. Your reward for climbing might be one of 900 Korok seeds (many hidden behind fiendish puzzles or tests of skill. Others merely resting under a rock), one of over 100 shrines (which itself will often contain a delightful series of puzzles with multiple solutions), or just a beautiful view and a point from which to launch yourself and glide serenely over the earth below. Or perhaps you’d rather ride your horse and stick to the roads? Much thought and care was obviously put into the routes and sight lines when traveling the path of least resistance and it shows. Mounted enemies harass me on my way to a stable, making it seem natural when a person near the stable complains about them and asks for my help. Exploration is helped by the fact that “towers” in this game only automatically fill in terrain details and a few place names. The actual locations of the shrines, villages and stables are only revealed naturally as you discover them. The engineering really shines here as draw distances, level of detail scaling and the art style all merge seamlessly to create a very real sense of presence in the world. Certain major events in the game alter the landscape permanently and create a constant reminder of your prior success and future goal. Despite using an industry standard physics engine, the actual integration into the game world and its effect on game-play goes way beyond just the incidental atmospheric effects I’ve seen before. This is a game of rules. Ice melts, fire burns, metal conducts electricity, there is gravity! These rules and more are used to present situations where multiple solutions exist and your imagination is the only limit. Approaching every encounter like MacGyver and finding new ways to combine the limited tool-set is the most fun a game has delivered in quite some time. Enemies drop weapons you can use, but the reverse is also true! The special abilities exhibited by that Windcleaver work just as well in that Moblin’s hands as yours. Tactical freedom is matched and perhaps even exceeded by the strategic freedom on offer. 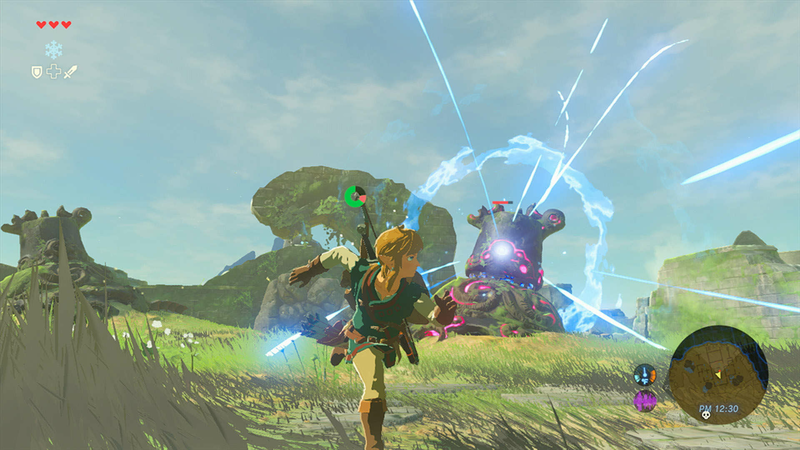 At the end of the “tutorial” – a small area with four shrines to complete in any order – you are given a quest marker and told to defeat the final enemy! Few that choose to do this immediately will succeed, but the option exists. If running head-long into the clutches of ultimate evil doesn’t tempt you, set out in literally any direction to find food, weapons, and the power you need first. Power comes in many forms, from the ingredients you collect in order to cook a special meal that buffs your abilities, to the pieces of armor that you acquire and possibly upgrade to unlock additional defense and set bonuses, the mostly disposable weapons and shields you loot from hidden chests and felled foes, and the permanent upgrades to your health and stamina you can allot once four shrines are cleared. And the Korok seeds. So many Korok seeds. Some simple and easy to complete, others seemingly impossible, but like everything else in the game always optional and never a gate on your progress. Unlike most recent adventures Link has been on, there are no “gimmick gadgets” that only work in prescribed ways in designated places that are to be acquired in a specific order to succeed. After getting the first four initial abilities Link is in possession of everything necessary to complete his journey, and anything else you’d like to snag along the way is entirely optional! Not to say that none of the upgrades are worth-while though every player will likely find a slightly different set of “must have” gear they prefer using to infiltrate Hyrule Castle and do battle with ultimate evil. After spending over 100 hours immersed in this latest iteration of Hyrule I can say with confidence this is the best playing game I’ve ever played.